John knew who the Christ would be, as well as what His mission would be. John had seen from God that Jesus would baptize those who followed His message “with the Holy Spirit and Fire.” He knew Jesus’ would be the ultimate judge of all. He would expose any pretense and destroy anything or anyone that did not meet His standard. Jesus assures John that this is the proper order of things and John agrees to do as Jesus asks. John takes Jesus into the Jordan, like he had done so many times before, but this time his is feeling so unworthy to be doing this. His heart is twisting because he knows what his baptism ministry means. How could Jesus even think He needed to repent of His sins? “I will follow Your directions, but oh Jesus, this is so backwards. How can You possible want me to do this for You?” Deep breath. Just do it. John takes hold of Jesus neck. Does he pray for “the sinner” like he has always done before? What words does he say just before he pushes Jesus backwards into the water? 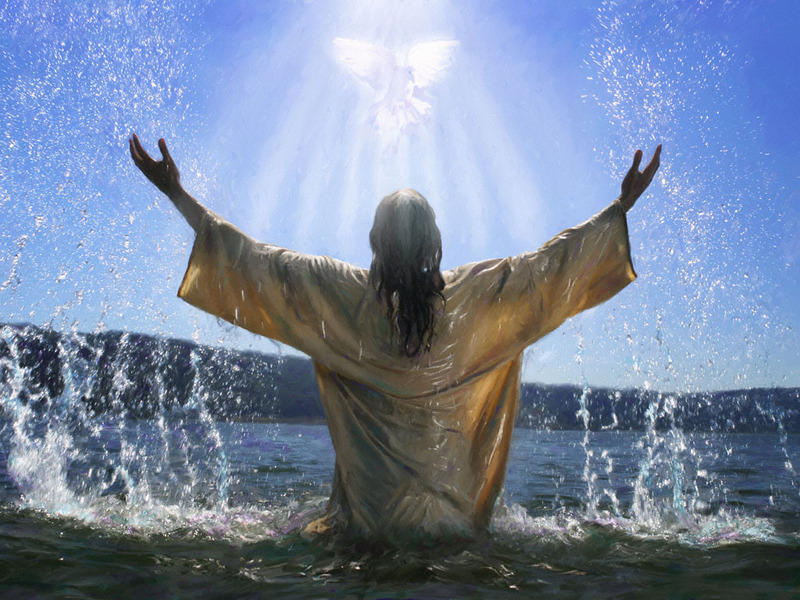 Down Jesus goes into the water like all those before Him had done. John’s strong arms then contract and bring Jesus back to the surface of the water. As he is standing Jesus on His feet, the same as he has done with everyone before Him, there is electricity in the air. John feels something shift. Something different! The Heavens open up and a bright light shines on them as they stand in the water. A dove descends from Heaven and lands on Jesus. Then God Himself speaks and confirms Jesus as His Son and His actions as pleasing to Him. John’s heart is nearly bursting with joy! To be part of this Father/Son moment was beyond comprehension. Does he fall to his knees right there in the Jordan and begin praising God? Does anyone else see and hear the witness or was this confirmation just for John? Whatever anyone else saw and heard, God spoke directly to John’s heart. John knew he was on a mission from God from the beginning. He was waiting, maybe not entirely patently, for Jesus to fulfill His purpose and save him. Now he was seeing the beginning of that promise. Finally things were underway. I have often felt like John there at the edge of the Jordan when Jesus approached him to be baptized. How could He possibly think I had anything of value to offer Him? He is the Creator of the universe. I am just a lowly woman. I still feel like this on a daily basis. But He assures me anyway that He wants me and wants the talents He placed in me. I don’t get that awe inspiring confirmation that God granted to John as Jesus came up out of the water, but He does let me glimpse His hand at work at times. When something I write or say actually helps someone I feel His voice whispering, see I told you I had a purpose for you. Please keep using what You share with me to help someone else too. You touch me SO often through Your word and the pen and paper. I truly believe You want me to share what we share. I NEVER want to get in the way of Your message. If at ANY time You feel I am not sharing what You want or that I need to stop, PLEASE tell me. Forgive me in advance for the times I am going to blunder. Repair the damage that I will at some point do. Even use that broken spot to speak Your message. I Love You Lord and want to do Your will alone. As John said that morning, I am SO unworthy! Thank You for using me in spite of my condition.